KLX 140 Pitbike was chopped for the fork tube and rake; Pit bikes are great on tarmac with sticky tyres on. Keeping the Pitbike front section retained the original geometry be it looking a bit different. We robbed the engine from our Polini 94cc Piaggio Zip which we love, Polini Big Evolution 94cc, 52mm piston with 44mm long stroke Polini Evolution crankshaft. 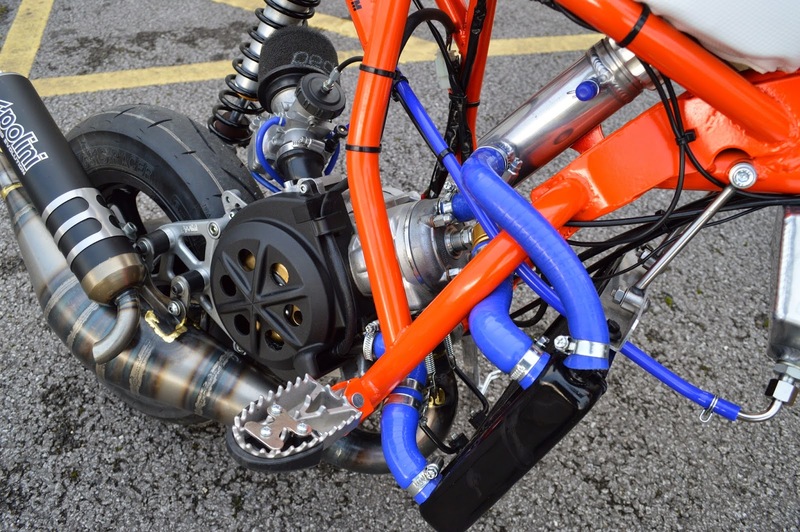 Polini digital ignition with Big Evo exhaust, 9 roller variator, 33mm Keihin carburettor from a Yamaha Banshee 350cc quad. 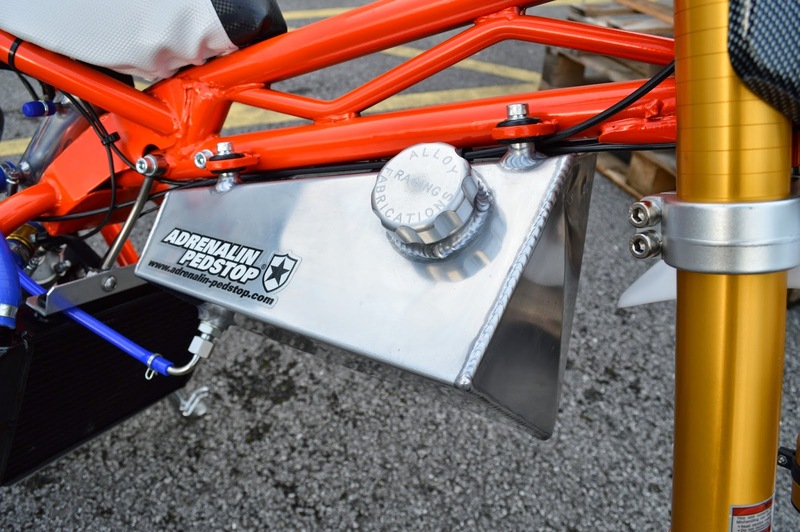 Bespoke petrol and expansion tank with an oversized radiator also taken from one of our race scooters. 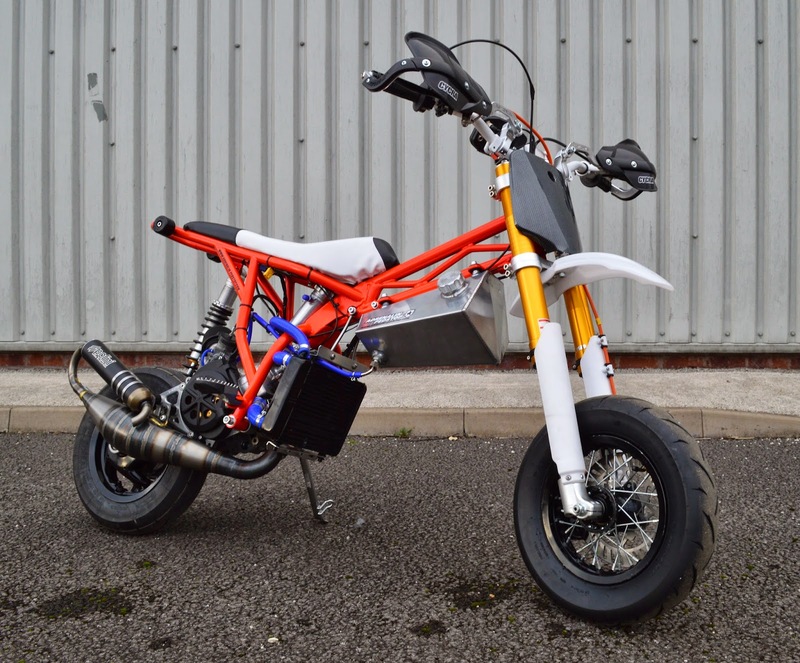 I better mention the chap that fabricated the frame for us from some very sketchy sketches “Fat Shaun” sorry Shaun I meant Fatspeed now in their new unit fabricating one off motorcycle specials Down and Out Café Racers. 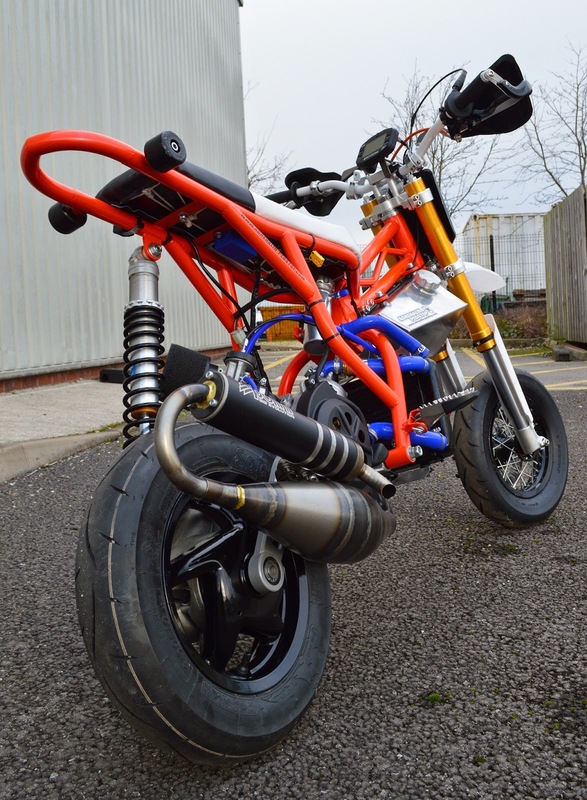 Not the usual for these guys but frames are frames especially when it’s something quirky like a Pit Bike. All of the pictures above are of the now repaired bike “Post Accident” almost as a good as before with the help of some insulating tape and not so perfect cable routing. The seat has been recovered as this wasn’t bolted down during the first test session so took some damage; in fact ha ah that’s what did my ribs. What next, well we want to see it go around a track just like you with a good pilot not some old arse wannabee like me. Anyways we really can’t risk wrecking it again it’s so pretty. We have somebody in mind that can go around a track fast on pretty much anything and he’s young so he will bounce better than any of us.